ENERGY STAR® standards are important because second only to residential heating and cooling, home water heating is number one in residential energy consumption. Even as homes are designed to be more energy-efficient, the percentage of energy used in water heating is still a predominant factor. When it comes to efficiently heating water, tankless water heaters are one of the hottest innovations to hit the industry in decades. The appeal of tankless water heaters is that you can save money by not constantly heating the water in your tank during periods when you are not using hot water. 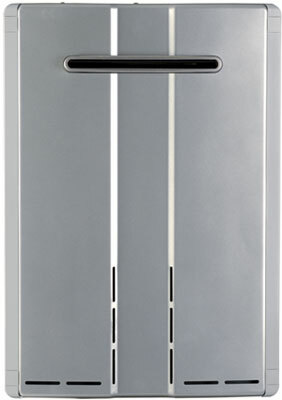 GE® tankless gas water heater provides constant hot water while conserving energy. You'll want to check out the new GE® Tankless Gas Water Heater, which provides what no old-fashioned, tank-style unit ever could: a continuous flow of precisely heated hot water. There's no tank, so it can't run empty. And the water stays hot until you turn it off. Demand-activated technology also translates into significant energy savings. A GE® tankless gas water heater could help you save up to 55 percent annually on water heating costs compared to the operating costs of a standard 40-gallon-tank gas water heater. Rinnai's® Tankless Water Heater is able to supply continuous hot water to multiple plumbing needs. You'll also want to check out Rinnai's® new Condensing Tankless Water Heater, which is available in four models, suitable for mid-to-large-sized homes and provides up to 97% thermal efficiency. Rinnai's unique condensing design incorporates two innovative heat exchangers to achieve optimum heating value from every cubic foot of natural gas or propane. Examining your lifestyle. 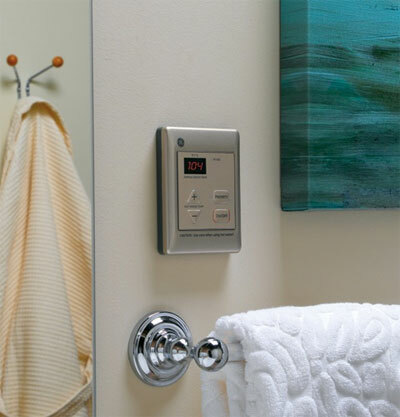 A strong tankless heater can pump about 5 gallons a minute of hot water throughout your whole house. But if your children enjoy taking 15-minute showers while you run the washer, this might not suffice. Calculating your flow-rate demand is key in determining whether to install one heater for the whole house or multiple heaters for different appliances and bathrooms. In a busy household, all of these appliances running at the same time can challenge a tankless heater's ability to meet hot water demand. In addition, the climate conditions where you live can affect the performance of your heating unit. Decide what size you need. While the capacity of gas storage water heaters is based on the number of gallons that will fit in the tank, tankless models are rated by how many gallons of hot water they produce per minute (GPM). The more likely you are to have the shower, dishwasher, and clothes washer going at once, the larger the GPM you will need. You will need to consult with an experienced plumber to estimate the hot water demands in your home. Check product availability. Find out what qualified tankless models are available on the market by viewing the ENERGY STAR® Product List. Get a quote from a contractor or retailer. You may want to check a manufacturer or retailer's web site to get a general idea of cost, but you will eventually need an installer to come to your home and give you a customized price. Search for rebates and tax credits. You may be able to reduce your costs by taking advantage of rebates or tax credits. Be sure to review the eligibility rules before you make your purchase. For example, most ENERGY STAR® qualified tankless models will qualify for a Federal tax credit. There are four ways to cut your water heating bills: use less hot water, turn down the thermostat on your water heater, insulate your water heater, or buy an ENERGY-STAR® model. Be sure to work closely with your builder, so you can choose the most effective and efficient water heater to handle your needs and lifestyle.